Capsule were invited for the 3rd year running to produce a showcase at this years Sonar Festival in Barcelona. 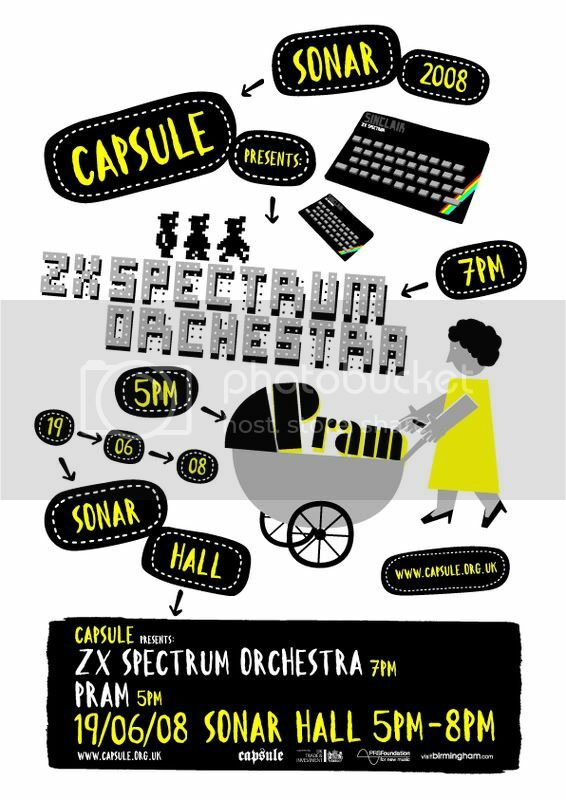 We put forward two Birmingham bands ZX Spectrum Orchestra + Pram, which took place in the Sonar Hall on Thursday 19th of June. Both acts performed to a full to capacity hall (3000 +) with an overwhelming response from the audience, this was our best response yet. We also had a stall in the record and media fare, selling our wares. With thanks to Ben Javens/Pram/ZX Spectrum Orchestra/Jacob + Kate/Dan Davies/Film Ficciones/Geoff Dolman/Juan Rae/Ian Rogers/Katherine Godfrey who all took it in turns to man the stall and promote Birmingham. We produced ‘Capsules Guide to Birmingham’, a free leaflet which is by no means a definative guide to our fair city but trys to give an alternative view to visitors who will attend Supersonic and to intice those at Sonar. It includes recommendations of things to do/places to stay/eat and shop. It was co-ordinated by Capsule, written by Dan Davies and designed by Ben Javens.